There is no question that “President Xi [Jinping] is building a personality cult.” His efforts appear to have accelerated in the past several months. In September, the Chinese government released a three-minute montage of foreigners praising “handsome” Xi, then a cartoon rap video extolling his anti-corruption campaign in December. The deputy director of the state-sponsored news agency Xinhua built upon this theme of using verse, writing an homage to Xi after the President visited the agency’s offices in February. 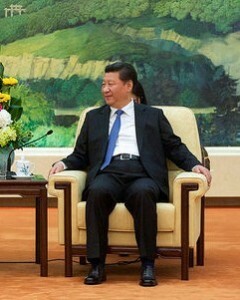 Despite–or perhaps due to–the inflation of Xi’s image, a letter demanding his resignation from the dual post of President and General Secretary appeared online on March 4, the eve of the Chinese Communist Party (CCP)’s annual “two sessions.” (Amazingly, this is not the first media reference to Xi’s resignation, as a typo to that effect was mistakenly printed in a December China News Service article.) The open letter mostly escaped the attention of the Chinese public, for it was originally published by a foreign media service and removed almost immediately after being re-posted on a domestic news website. That the letter appeared at all on the mainland Chinese internet means that it bypassed party censors. Whether an oversight or deliberate flouting of censorship practices, the letter’s publication on Wujie Media inflamed Chinese officials. It is indeed surprising that such a letter slipped through, given how the government has been restricting the media’s purview. For the most part, this crackdown has been as effective as the anti-corruption campaign, albeit much less welcome. Such a response might be considered an overreaction. The letter was written anonymously, which undermines its clout as a critique. Some of its criticisms are also unjustified, such as the accusation that President Xi is responsible for the recent stock market turmoil. Structural concerns about the Chinese economy drove the sell-off. The opacity with which Xi and his small group of economic advisers design interventions could not have helped, but the mechanisms that exacerbated the stock market collapse (e.g. price floors) predate Xi. Yet the letter has struck a chord, given that the government has reacted thus. Concerns abound around Xi Jinping’s consolidation of power. This tightening grip on power, as well as the violent response to challenges thereof, hearkens back to the era of Mao. The letter’s author(s) fear a new iteration of Mao’s Cultural Revolution, an alarm still more palpable for the fact that ten-year period is not oft openly referenced. The inviolate cult of personality around Mao indeed precipitated the Cultural Revolution; the persecution of those implicated in the letter suggests that this prophecy might prove self-fulfilling. The one does not necessarily follow the other, however. The Communist Party’s pursuit of dissidents is not unprecedented. Tian’anmen Square famously transpired under Deng Xiaoping, to whose leadership style the letter’s author(s) wholly subscribe. Xi is nonetheless different from past Communist China leaders in many ways. Whether those differences extend to how he and his government handle this open letter remains to be seen.